Summer is all about spending time outdoors and if you’re lucky enough, on the water! Last summer we introduced Lake Horseshoe, a man-made lake, to our guests and the local community. 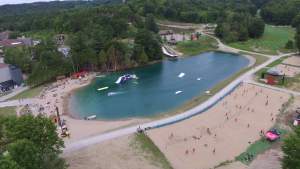 Featuring a sandy beach and fun waterfront activities, Lake Horseshoe has quickly become a summer favourite! 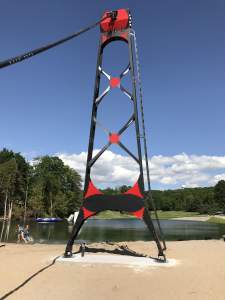 We decided to kick things up a notch this summer by adding a wakeboard cable system to the lake. Did you know that wakeboard cable systems are the safest and easiest way to learn how to wakeboard? You also don’t need to have your own gear or access to a boat. Not familiar with how a wakeboard cable works? It’s actually pretty simple. Large towers are set up around a lake/water surface with an overhead cable between them. A long rope is attached to a carrier along the cable and the rider holds on to the rope handle in order to get pulled around the water. No boat required! The cable operator is able to adjust speed, stop and start with the touch of a button. Not only is it a great learning environment for beginners, it also allows experienced riders to train and practice tricks in a controlled atmosphere. 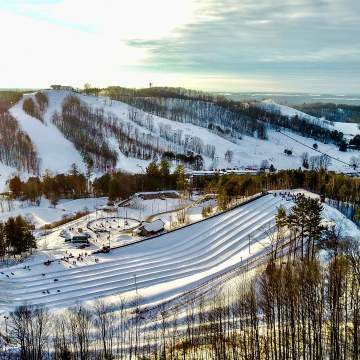 Water skiing cable parks have been around since the 1950s, long before the sport of wakeboarding became popular. 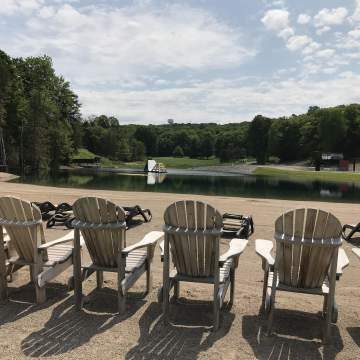 Fast forward to today and wakeboarding is now one of the fastest growing watersports, with wakeboard cable parks also growing in popularity and demand. 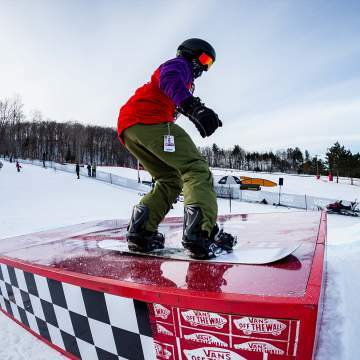 Cable parks have a number of features such as kickers, rails and boxes for riders to do tricks on. The number of features depends on the size of the cable park. 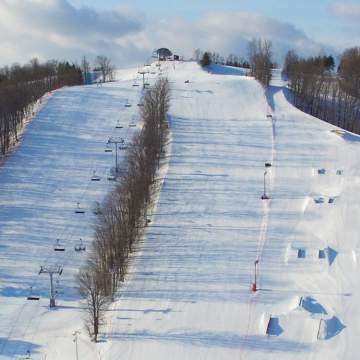 Lake Horseshoe currently has three features–a kicker, up rail and box. If you are new to wakeboarding, our Wakeboard Instructors will help you every step of the way! 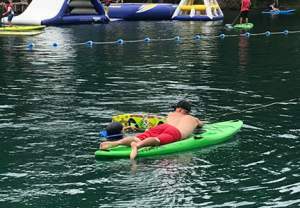 From setting you up with the proper gear to giving guided instructions, they will make sure that you have all the tools you need to learn how to wakeboard. A single session typically lasts for ten minutes. Sessions can be booked by visiting the Beach Hut located at the lake. You can purchase a single session or choose from 10, 25 or 50 pack runs. Check out the below video of one of our own team members trying the cable for the first time. Summer at Horseshoe Resort has never been this fun!